Eat Drink Design is a temporary restaurant inside a greenhouse set up on Lichtplein in Eindhoven during this week's Dutch Design Week. Now in its second year, the project brings together designers and chefs: Dutch designers have furnished the interior of the space and each night one of the designers teams up with a leading Dutch chefs to put on a dinner for evening guests, who need to book in advance. Cafe-style snacks and drinks are also laid on for people who visit during the day (no booking required for this). 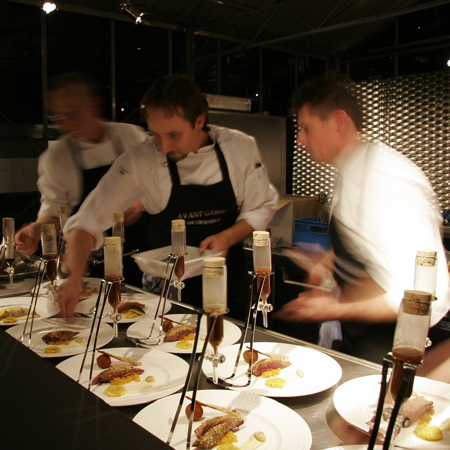 The action photos here show the dinner created by Eindhoven restaurant Avant Garde and designer Maarten Baptist on Sunday night. Enjoy an espresso or some bubbles, meet a few friends and relations, have a lengthy luncheon or an elegant gourmet dinner and enjoy the work of Dutch designers. 'Eat Drink Design' is where Dutch Design and culinary expertise come together. During the Dutch Design Week 2007, 'Eat Drink Design' will link eight designers to eight top-class restaurants from Eindhoven and surroundings. Every evening, a new duo will be presenting the result of its short-term collaboration in a glasshouse on the Lichtplein in Eindhoven. What this will be exactly is still a surprise: a dinner service or table linen, or perhaps even an entirely new way of looking at food. The temporary restaurant plus exhibition, which has been furnished with work by Dutch designers, will also be open during the daytime. During the Dutch Design Week you will also be able to enjoy a special Dutch Design Menu and the result of the project at the participating restaurants.